In the 20th century, the various governments of Afghanistan were actively involved with the international community in adopting human rights initiatives, including gender equality. However, the conservative nature of Afghan society coupled with weak central governance limited each regime’s ability to extend modern programs beyond the major urban areas. Initiatives that the constitutional monarchy and communist government attempted to implement often faced significant opposition from the countryside and were ultimately eliminated with the rise of the Taliban. Afghanistan joined the international community in ratifying the Universal Declaration of Human Rights (UDHR) in 1948 and established legislation and processes to integrate women into public life from the 1950s through the 1980s. However, in 1996 the Taliban relegated women to a domestic role with brutal enforcement. With the establishment of the Government of the Islamic Republic of Afghanistan (GIRoA), Afghanistan entered a new era for gender integration. In compliance with modern international human rights agreements and reaffirming its commitment to the UDHR, Afghanistan reopening opportunities in the public and private sector through its Constitution and supporting legislation. With the assistance of NATO’s International Security Assistance Force (ISAF), GIRoA is establishing the governmental institutions and societal conditions necessary to implement and enforce these laws. ISAF’s mandate is to assist the GIRoA by supporting security, strengthening government structures and contributing to development and reconstruction as supported by the Constitution of Afghanistan (Olsson and Tejpar 2009). One of ISAF’s goals is to enable GIRoA to continue its gender strategy without ISAF support. ISAF’s subordinate headquarters for force generation of the Afghan National Security Forces (ANSF) is the NATO Training Mission-Afghanistan (NTM-A). NTM-A’s mission is to generate the ANSF, develop capable ministerial systems and resource the fielded force to build sustainable capacity and capability in order to enhance the GIRoA’s ability to achieve stability and security in Afghanistan. NTM-A, in coordination with NATO allies, partners and key Afghan stakeholders, develops the ANSF in compliance with international agreements and Afghan law and thereby enables Afghan gender integration within the ANSF, Ministry of Defense (MoD) and Ministry of Interior (MoI). As ISAF transitions security operations to the GIRoA by 2014, NTM-A is executing a supporting plan to transition security force generation, education and training to the ANSF. Care must be taken to execute the transition in a manner that underwrites hard-won gender integration accomplishments. Gender integration is both the right thing to do and the pragmatic thing to do. It upholds international principles and bolsters Afghan security and stability. Nevertheless, its implementations must be metered through Afghan governmental authorities and the Afghan society’s willingness to adapt. 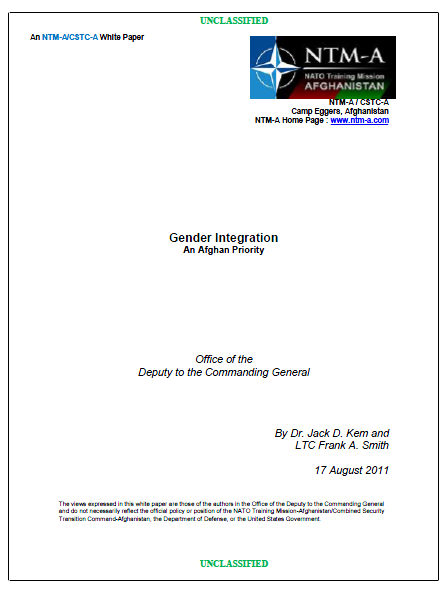 This white paper describes the GIRoA’s legal framework and policy for gender integration and NTM-A’s supporting role as NATO’s force generation headquarters in Afghanistan. It provides an analysis of the ANSF, identifying strengths, weaknesses, opportunities and threats or challenges. It proposes considerations as NTM-A transitions the force generation mission to the ANSF by 2014 that would bolster support to GIRoA national objectives regarding gender integration. Afghanistan needs strong gender integration policy and programs for both idealistic and realistic reasons, but will continue to be challenged with implementation because of its conservative Islamic culture and tradition of strong rural independence. The GIRoA has participated actively in multinational agreements supporting gender integration and has incorporated gender integration into its foundational legislation. Since 2002, Afghanistan has been the recipient of significant international aid to support its reconstruction. The international community is vested in Afghanistan and is scrutinizing how Afghanistan meets its obligations under the United Nations agreements. The Constitution of Afghanistan declares that men and women have equal rights and duties before the law and GIRoA has integrated, or mainstreamed, gender into its stated national goals and into government at all levels. The MoI and MoD have an obligation to contribute to the attainment of national goals on gender equality. Gender integration within the ANSF will support the attainment of national goals and improve security and stability in Afghanistan. Pragmatically, the ANSF need female members in order to be effective security forces. Afghanistan is a conservative, Islamic society. The Afghan National Police (ANP) and Afghan National Army (ANA) are virtually all-male organizations. As a result, the ANP cannot respond effectively to incidents involving women as suspects, complainants or victims. Properly empowered policewomen can react to violence against women, family violence, children in trouble and kidnappings. They can interrogate, detain and investigate female suspects; provide support to female victims of crime; and ensure the security of women in communities (Murray, Report on the Status of Women in the Afghan National Police 2006). The ANA is equally ill equipped to conduct counterinsurgency operations within the Afghan population without female counterparts to attend to female detainees and female casualties on the battlefield as well as interact with female citizens. Female soldiers can support combat operations in career fields such as intelligence, logistics, medicine and aviation. Similar to their police counterparts, they can interrogate and detain female combatants; provide support to female casualties; and ensure the security of women on operational objectives. Female ANSF can provide culturally mandated separation between male security force members and females encountered in the course of duty. Additionally, they can provide critical service and support capabilities by serving in logistics and aviation specialties. The GIRoA can utilize the ANSF as a tool to implement gender integration policy and gain greater security and stability.